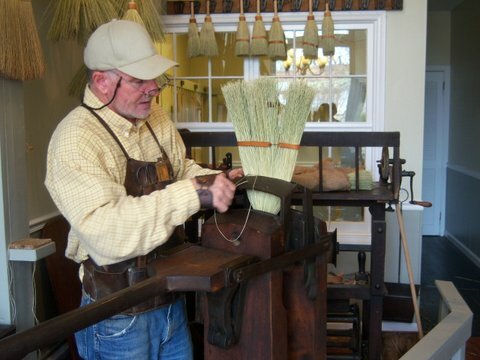 Kick n' Stitch Brooms, part of Han Dun Trades (hand done trades), is an online museum dedicated to "corn" brooms, the machinery used to make them, and other related subject matter. It also serves as an online store. The workshop is presently located at a private residence and not open to walk-in traffic but by appointment. The pictures are collected from past shops. Kick n' Stitch Brooms offers a variety of general purpose brooms as well as specialty items. 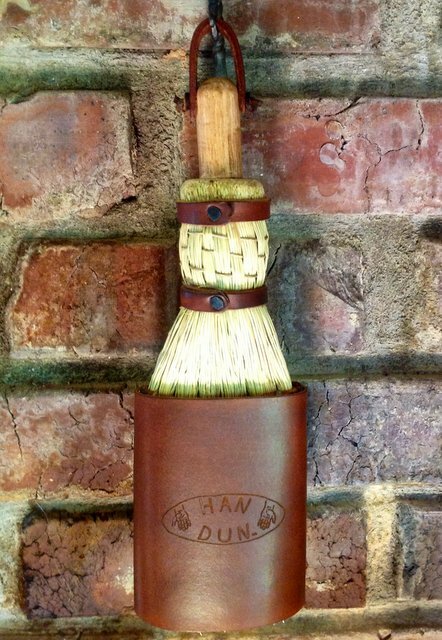 See the brooms page to browse available styles. Due to time requirements in layout and perfecting new designs and styles Kick N Stitch Brooms does not take special custom or personalized orders. We do, however, continually explore new styles and designs to offer. After "stumbling" upon some antique broom making equipment by happen chance in the mid 90's and subsequently leaning to operate it under the tutelage of an old order Mennonite broom maker in PA, Mark's interest in this heritage trade snowballed into an extensive late 1800's workshop with period accessories and a collection of older machinery and related broom subject matter making up the small museum. Thank you for visiting the site and I hope you enjoyed and maybe learned something new from your visit.